We’d love your help. 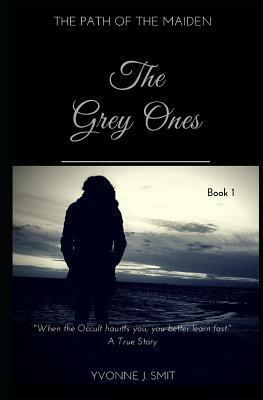 Let us know what’s wrong with this preview of The Grey Ones by Yvonne J. Smit. To ask other readers questions about The Grey Ones, please sign up. I'll be honest, I did not expect to like this book this much. It's not really my genre exactly, but it's a mix of memoir and paranormal following the author, Yvonne Smit, as she explains her intuitions with various members of her family. The writing is fairly simple, which took a bit to get into the story since a part of me thought it read like a debut book, and some of the dialogue is a bit cringe worthy. But the actual topic of Sm I was given this book for free in exchange for an honest review. The writing is fairly simple, which took a bit to get into the story since a part of me thought it read like a debut book, and some of the dialogue is a bit cringe worthy. But the actual topic of Smit having premonitions and being able to read people's auras and seeing "Grey Ones" is pretty fascinating. I don't love the style of the book, with Smit alternating between talking to her family members and then explaining the theme with a personal story from her past, but I think this is the way to best get the information across. A lot of questions that outsiders might have about things are asked through her children, and once you get about 50 pages into the book, you are pretty invested in just seeing how the rest of the book plays out. This is for sure one of my favourite books of 2019. The book had me gripped from the beginning and putting it down isn't easy. I found the book to be quite down to earth for a book of this subject. It's an easy read, but also one you can learn from. I am looking forward to reading book 2 in this series, and seeing where the author's journey takes her and her family. Brilliant read I loved this book I hardly put it down and when I did put it down it wasn't for long I really didn't want it to end but when it did I was left wanting more! The ending is a cliff hanger which I love/hate lol. I won this book from Goodreads (kindle version) for an honest review. I wasn't too sure about this book at first. However, the more I read it the more I enjoyed the story being told here (and frankly could not put it down). This book had a bit of a Sixth Sense vibe but less of a mystery on the main character (meaning she is not dead and doesn't know it) and not written as scary. Well narrated this story will take you on an unexpected journey and open your eyes up to all that goes on in this worl I won this book from Goodreads (kindle version) for an honest review. I won this Kindle edition book in a GoodReads giveaway. Thank you to everyone involved. The opening lines of this book really struck me. I was immediately wondering what would happen next. Though at times it was a bit slow, I really enjoyed the perspective of the book. Yvonne born in the Netherlands is the fifth child of an Accountant and a homemaker. The first four years, she grew up in Weesp, a small picturesque town near Amsterdam. Just before she turned five, her parents decided to relocate their growing family and moved Yvonne with her three sisters and two brothers to the rural village of Doorn in the province of Utrecht. Creativity has been Yvonne's streng Yvonne born in the Netherlands is the fifth child of an Accountant and a homemaker. The first four years, she grew up in Weesp, a small picturesque town near Amsterdam. Just before she turned five, her parents decided to relocate their growing family and moved Yvonne with her three sisters and two brothers to the rural village of Doorn in the province of Utrecht. Creativity has been Yvonne's strength from an early age. As a young child, she would escape into her drawings, stories or express her feelings in music. If it wasn't for the struggle to come to terms with Dyslexia, she would have pursued a career in Journalism. Dyslexia was not the only obstacle she had to deal with. Growing up in the seventies and eighties there was no internet to consult. Neither did the local library stock up on self-help books for those with a well-developed sixth-sense. Questioning her own sanity, Yvonne learned the hard way that not everybody sees The Grey Ones, The Shady ones or those who live in Shadow. Wanting to take on a tranquil, mundane life, she held a multitude of jobs in varying positions. From Clerk to Manager, Employed and Self-employed. She ploughed herself up in the world of Charity, Fashion, Transport, Events, Craft Markets, Therapy and Security. There were many successful jobs to choose from and to make her own if it wasn't for this one position. A vacancy in a field of expertise she at first didn't want to accept: The Occult.